Writing alongside those in the #compelledtribe, we commit ourselves to reflection through writing. Personally and professionally each member of the tribe has had their own takeaways on how it has, and will, impact their teaching, leading and learning. 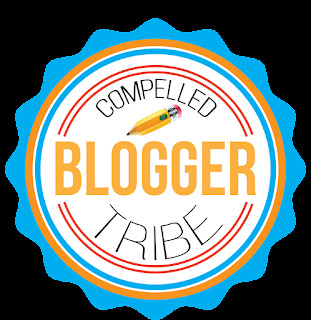 Blogging is not about self-promotion. It is not intended or suggested to be a platform for ones agenda. Rather, blogging is about growth. As we consider the profession we are in, it should be apparent that we blog to become more skilled in what we do. The writing we share and the time and mental consumption of our words are merely intended to be a part of the bigger journey. As I think about the time away this summer and the experiences I have enjoyed, I immediately find myself connecting these back to my school, my students and the community I serve. Simply stated, life is a series of moments and experiences that will shape and define ones own story. If that is the case, then the opportunities these past few months have me prepared for the weeks and months ahead and are setting us up for some great successes. Here are some things to consider as you head back-to-school and how your experiences this summer may become a spring-board of excitement and direction for the path you are about to embark down. 1. It starts and ends with relationships. 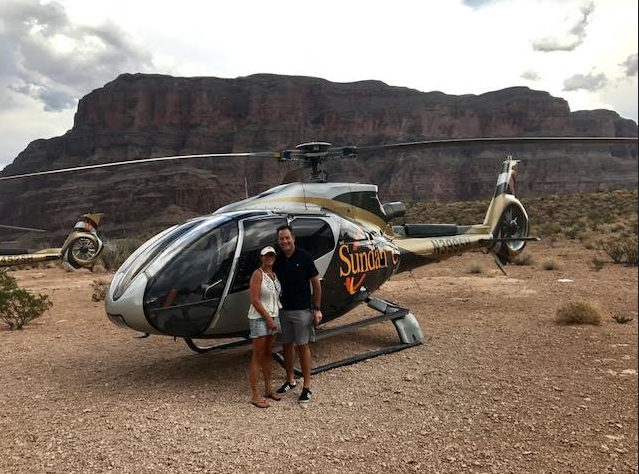 A summer of various events could not, and would not, have been as enjoyable as they were if it were not for the genuine care and support of the people that were on the journey together. Whether immediate family or close friends, the better we knew each other, the more value there was in the experience. As you head back to school, put this first and keep it there. Know your community of learners and leaders. As the year progresses, do not lose sight of the importance of those relationships from the first day all the way until the last. 2. Get out of your comfort zone. Personally I like my comfort zone. Two feet on the ground, routine and planned events are my norm. This summer I put that mindset on the back burner. One could say that I adopted a growth mindset for adventure. 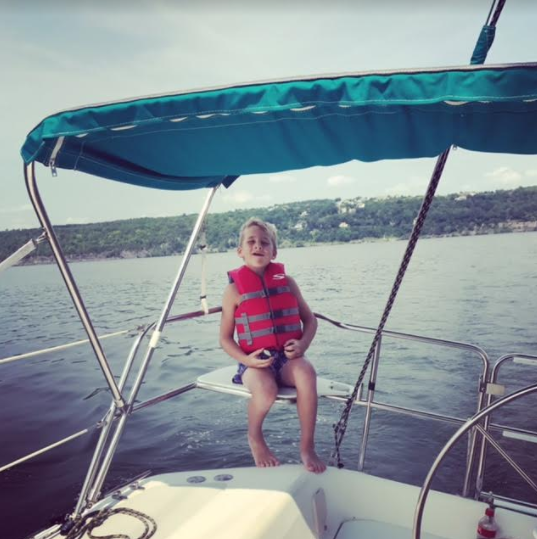 Whether a ride to the Grand Canyon high above the ground, sailing across Cayuga Lake or spontaneous outings with the family, it was invigorating and rewarding to push myself out of my comfort zone. Thinking of your staff and students, consider the same. Mix it up, try something new and expand your boundaries of teaching and leading. 3. Model the way. As my kids grow older I find them leading the way in some of our adventures. Where I would normally stick to that above mentioned schedule, I found myself pushing away from that and as this summer demonstrated, I modeled the way. As the summer moved on, I embraced the notion of having to model what is not only expected but also what is encouraged. Whether in the classroom or the conference room, do the same. Model what you want and what you desire to be attained and you'll be instantaneously amazed on the results you get in return. 4. Trust (and hold others and yourself accountable). Early in the summer the leadership of the district had an opportunity to continue our journey in building our culture by working alongside Tim Kight of Focus 3. Within his message something hit home in a way that I needed to here. He spoke in great length (but in simple terms) about the significance of trust in our profession. Heading back to the office this past week I am excited to have a greater understanding of how trust will be a focus of my leadership. Of course, as we lead others and observe those that we serve (and identifying when trust is broken) tough and direct conversations will follow. In your classroom this coming year consider how trust will play a role in your work with your stakeholders. If a building or district leader, do the same. Set levels of trust with those around you. Encourage them along the way. The list could, and should, continue as you apply your summer lessons to the work you are about to embark on. Remember that growing is part of what we do as teachers and leaders. Whether you do so through reading maybe even blogging, make a pledge to yourself that you will continue to push yourself and apply your life lessons, your series of experiences, to your daily work. A Summer Lesson. Surf's Up. 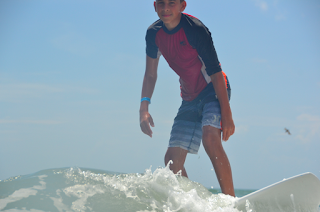 This past week I had the joy of watching my two youngest at surf camp. For the past three years they have each awoken before the rest of the house so that they can master the skill of riding the waves. Now in their third year of camp, I am impressed with their dedication and passion for a hobby that they only do for 5 days out of the year. Waves are hard to come by in Central Ohio. Throughout the week as I was watching them surf, I paralleled what they had invested into their learning of how to surf as to the work that we do in education. And as a part of any summer vacation of embracing learning throughout the year, I was quick to realize the parallels and the challenges. This time around I have been watching them catch wave after wave with a different lens. Yes, as a father but also as a teacher, leader and learner. What I was witnessing and what they had accomplished didn't happen just through showing up, it took much more than that. Here is what I learned by watching my boys riding the waves. Surf's Up - Know Your Learners. Before even taking to the water, the surfers were coached in basic water safety and given an appreciation for the craft of riding the waves. In addition, the camp counselors learned who their campers would be before setting out to the ocean seas. The counselors learned names and took an interest in their campers. The coaches were building trust. 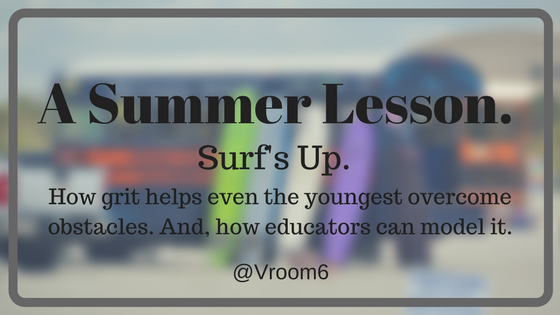 Educators, like surf coaches, recognize the need to know their learners. Going well beyond names, and well before instruction, we must know who it is we will be pushing and what knowledge they bring with them. We take assessments of their skills and come to know who they are. Like surf camp, trust is essential. Relationships first. Catch the Perfect Wave - Learn the Basics. One of the most challenging things for educators to do each year is to come back to "zero". With surfing, each week the camp counselors have to start "over" with a new crop of eager vacationers. 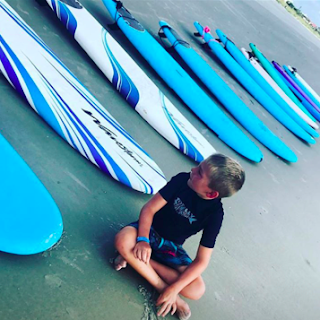 I watch in awe as they skillfully go back to the beginning of their week just coming off of getting the last week of learners to a skilled, maybe even an accomplished, level of catching the waves. As educators, one of the most rewarding moments of each year is watching our students get to the level they do as a school year wraps up. Like camp, we too must recondition ourselves to go back to the beginning. For many, that is the ultimate draw to the profession. Going back to "zero". 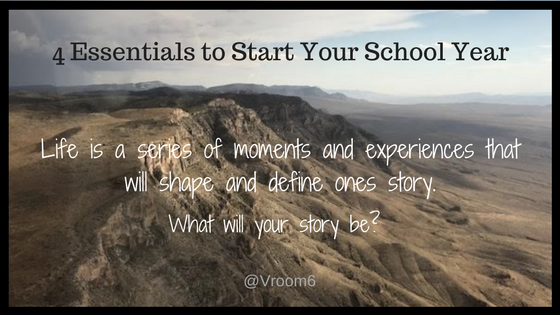 That is, taking our learners on a journey toward success even when it means starting from the basics of the beginning of the year. Point Break - Fail and Fall Again. As a parent it is not easy to watch your young surfer fall over and over into each passing wave. The struggle can be painful. Salt in the eyes, the smack into waves and the sheer reality that it is harder than it appears can bring the desire to quit and move on. However, they get back up and hit yet another wave. Through coaching and trust, each surfer is willing to try another wave in the hopes that this will be the one that sets them on a path of continued success. For educators, it is not much different. Failure will occur. Our role is to ensure they have an environment where risk taking is encouraged and students feel safe in their journey. Whether in a classroom or on the waves, keep going after what seems to be impossible. Hang Ten - Reaching Your Goal. Riding the Waves. Toward the end of the week, my little surfers were not so little. They had worked tirelessly each morning through trial and error, building confidence and learning from their mistakes. Likewise, as educators we provide an atmosphere where hard work and determination are praised and those that need additional support are provided such. We teach to the whole surfer/student and meet them where they are at and grow them from there. And above all else, just as we do in school, our surfers celebrate what they have accomplished. What a powerful week to watch two city slickers from the midwest learn and explore the art of surfing. This was more than just spending each morning in the ocean. They showed their resiliency and their determination as they persevered in the face of frustration and disappointment. For every fall into the water they hopped back on to their boards and set out to try again. As a parent, this was a powerful lesson for me as well. While I value the time our children are within a classroom setting, I have an appreciation for this worldly example of teaching and learning. Equally as amazing to watch was connecting how our youth work with our children as the teachers they are. The classroom is endless as our are opportunities to grow. Here is a quick slideshow of the 7 year old. His expressions speak louder than any words on a page. The look of amazement and accomplishment are all the measurement that is needed to assess his efforts. 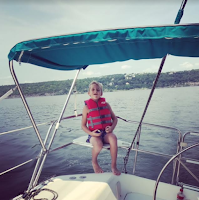 And, check out THIS MUCH WATCH VIDEO of his older brother (14) as words and actions take him from failure to success and how determination and grit get him to achieve the ultimate surfing goal. Hang ten, kid! With 25 years of educational experience I continue to learn and grow each day. I am passionate about my work and my family. 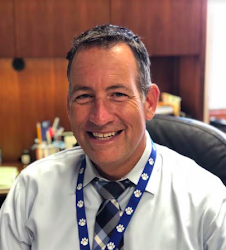 So You Want to be a Principal? So, You Want to be a Teacher?